Phase 10 dice game is a sequence dice-casting game played with custom Phase 10 dice. The objective of the game is to complete 10 phases in a specific sequence and score highest points in the process. 10 custom Phase 10 dice and a scoresheet. Phase 10 custom dice comes in a set of ten six-sided dice. Six of the dice contain numbers from 5 through 10 in 4 different colors. Remaining 4 dice contain numbers from 1 through 4 and two wild faces (marked with W) in 4 different colors. 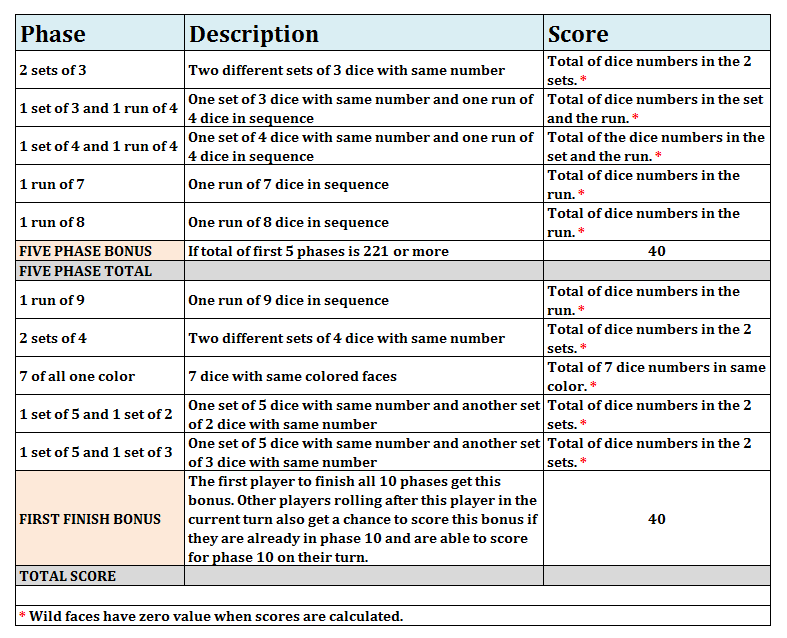 Each player rolls one die containing numbers from 5 through 10 and the player with the highest dice number starts first. The player with the next highest dice number plays second and similarly other players play from highest to lowest dice number sequence. In case of a tie, sequence is decided by a shootout roll. Players roll all 10 dice on their turn and have up to 3 rolls in each turn to score. After each roll players can set aside any number of dice and roll remaining dice. Players can also take some of the dice back for rolling which were previously set aside. The scoring involves making sets, runs, and colors. Sets: A set is made by several dice all of which have the same number. One or more wild faces (W) can be used in place of any number. For ex; three 6’s will make a set of three. Two sixes and one wild face will also make a set of three sixes where wild face is used as a six. Runs: A sequence of consecutive numbers. For ex; 5, 6, 7, 8 will make a run of four. One or more wild faces (W) can be used in place of any number. so in above example 5, 6, W, 8 will also make a run of four where W is used as 7. Colors: All dice faces have the same color. Wild face also needs to be of the same color as other numbers. There are 10 scoring phases which players are required to score in sequence starting with Phase 1 and then scoring in sequence from Phase 1 to Phase 10. If a player fails to complete a phase in his/her turn, then he/she must try to complete that phase in next turn. Player can not move to next phase unless previous phases are scored. When player completes a phase, he/she scores total of all dice used to make that phase. Wild faces which are used to complete a phase have zero value for scoring purposes. For ex; If 6,6,6 and 7,7,7 was used to complete “two sets of 3” then player scores 18+21 = 39. If 6, W, 6 and 7,7,7 was used to complete “two sets of 3” then player scores 12+21 = 33. The table below describes each phase and its scoring mechanism. Five Phase Bonus: Player gets this bonus after completing first five phases and if total of first 5 phases is over 220 (means 221 or more). First Finish Bonus: The first player to finish all 10 phases get this bonus. Other players rolling after this player in the current turn also get a chance to score this bonus if they are already in phase 10 and are able to score for phase 10 on their turn. As soon as a player completes Phase 10, the normal play ends and remaining players get one more turn to score as many phases as possible irrespective of whether or not they had already rolled for that turn. The players can score for more than one phases if they can finish their phases in sequence. For ex, if player A completes Phase 10, and player B was on Phase 8 at that time, then player B gets one chance to complete remaining 3 phases so on its turn player B will try to score for Phase 8, and if he/she succeeds, then he/she will try to complete Phase 9 and then Phase 10. If a player fails to complete a Phase anytime, his/her chance gets over and whatever phases he/she has completed in the last chance, gets added to their final score. Once all players have rolled for last chance, the player with the highest Total Score wins the game. It is possible for player who was not the first to complete Phase 10 to win the game.